I received this book in exchange for an honest review and this did not affect my opinion at all. I have never read a book before that focuses on ‘sea people’ so when I first heard about Deep Water, I was so excited to read it. After talking to Lu online, I got even more excited to read it so when it did finally come through the post, I was scared. I was so worried that it would disappoint me after I had hyped it up in my mind for so long but I’m so happy that I loved this book. Danni’s mother goes missing and then she discovers that it has something to do with her family legacy that she had no idea about. Danni is forced to move in with her dad in a different town where she meets new people, a lot of whom hate her. I really admired Danni throughout this whole novel. I have to like the main character in order to like the book so I was very happy about the fact that Lu Hersey has written a main character who is great. Danni is realistic and I can believe in her character a lot more because honestly, I would react similarly in her situation. All the other characters were also great. I loved Elliot and I especially loved their love story because it wasn’t a major part of the novel. She wasn’t thinking about him constantly which is what generally happens in these sort of books. I also loved the fact that she had a male best friend called Levi who didn’t affect the love story. There was no jealousy or hidden love and that made me so happy! Go Lu for striving away from the norm. My favourite thing about this whole novel had to be the mystery aspect. Whilst I probably guessed a few things before I should have, it still kept me on the edge of my seat waiting to see what was going to happen next. It was so intriguing and different because it wasn’t something that was predictable in the slightest. I also obviously loved the inclusion of the Celtic myth and folklore because it isn’t something I’ve read about before. Overall, I loved this book! I think it was absolutely brilliant as it was completely different and unique. The writing was fabulous as were the characters and the plot was so intriguing. I highly recommend you all go pick up this book because it is amazing and I can’t wait to see whatever Lu Hersey writes next. 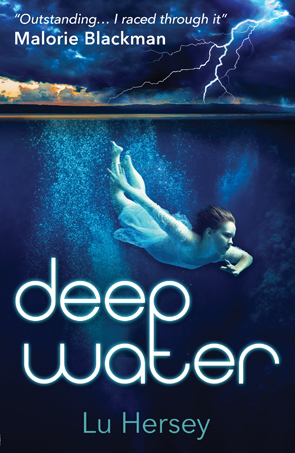 Such a lovely review of Deep Water from Sofia (aka The Reading Fangirl) – really appreciate her taking the time to write it. It means a lot. Aw thanks Sofia – sorry I only just saw this. Been a really mad week!